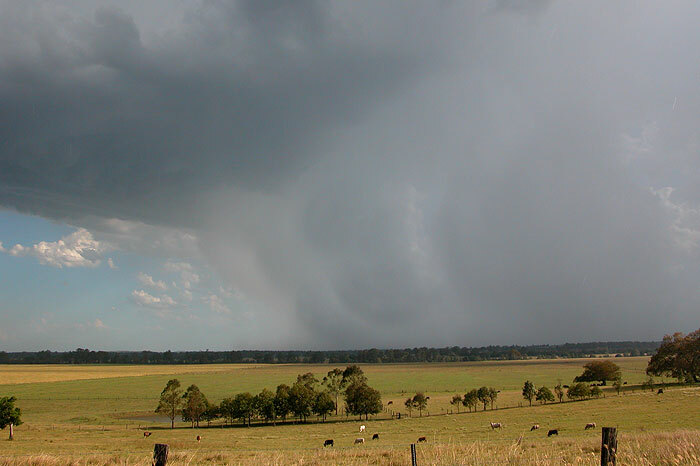 The storm season of 2004/2005 was not to be a standout one for the Northern Rivers, which typically receives the highest number of severe storms in NSW per year. 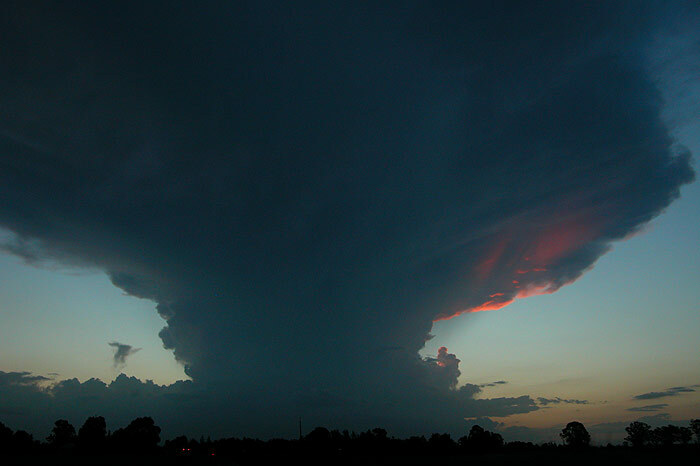 This season, Sydney and the Hunter dominated, with some excellent setups producing spectacular supercells which would not look out of place on the Great Plains in the United States. 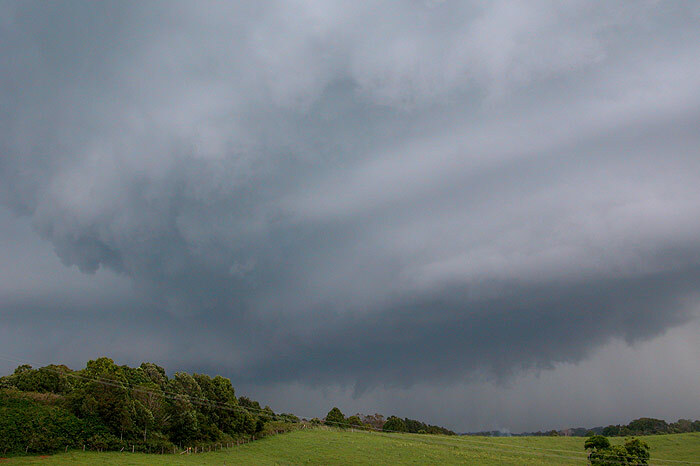 Despite this, the Northern Rivers wasn't completely left out, but it did mean that the season was only a satisfactory one for the Northern NSW chasers because of the extra effort put into longer distance chases. Another amazing feature of this season was the lack of excellent setups. At least one or two storm days per season in the Northern Rivers seem to be setups where supercells are a high probability. But there were no such setups this season. Despite many storm days where we were unsure just what would form, we still managed to see a number of supercells, get some spectacular photos, and even got our chase vehicle's windscreen smashed by giant hail!! Below is an account of the many storm days documented throughout the season. Click on an underlined heading to see a full report of that day. 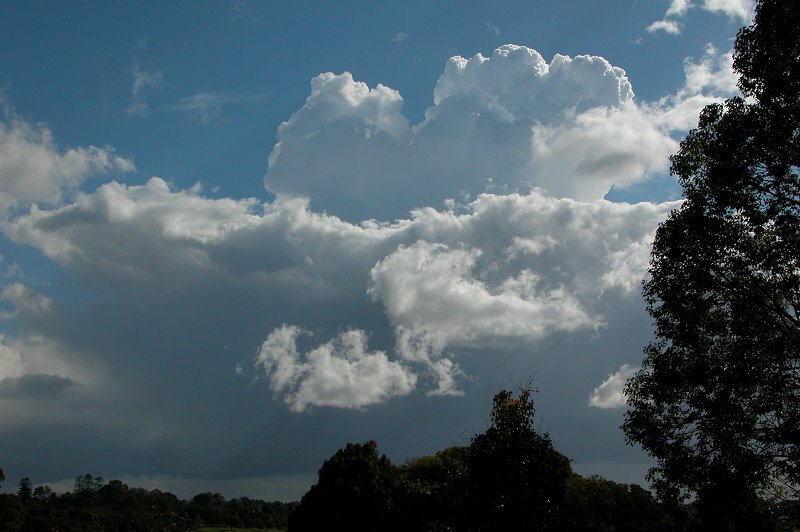 With a bit of instability around, some nice convection developed just off the NSW North Coast. 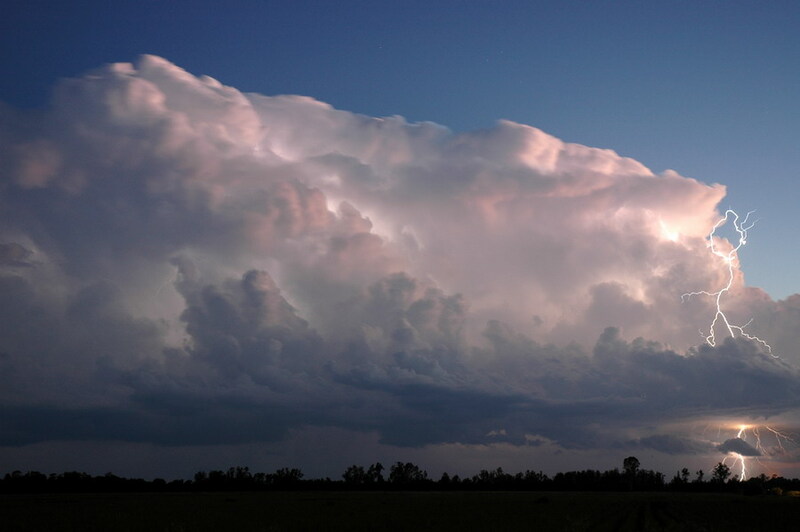 The storms, while not severe, looked quite spectacular as they were illuminated by the setting sun. 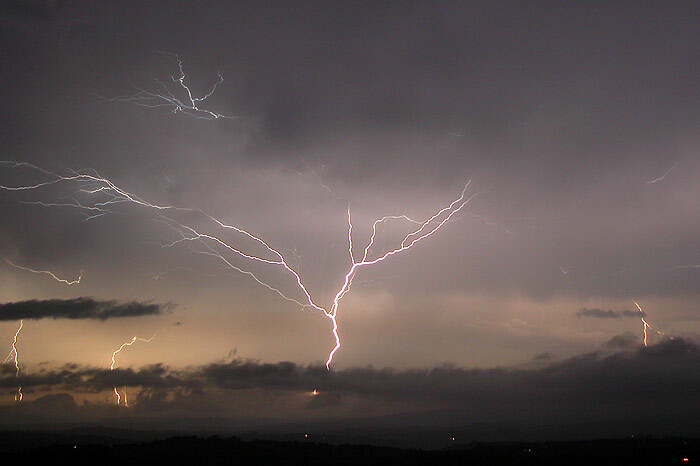 Some weak lightning activity was associated with the cells. 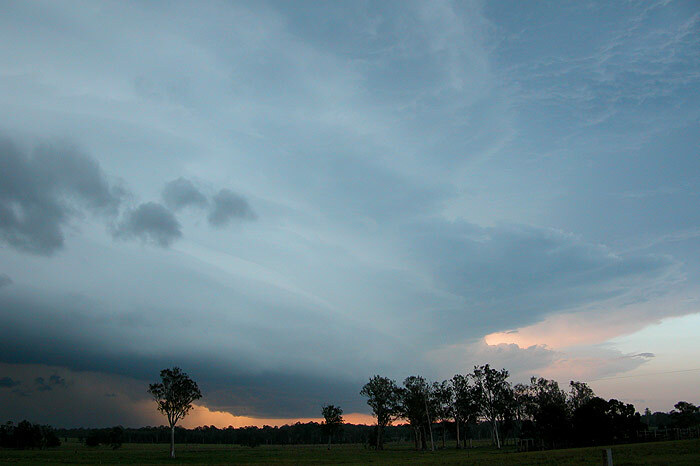 Spring 2004 kicked off with some nice storms in the Northern Rivers after a rather boring winter. 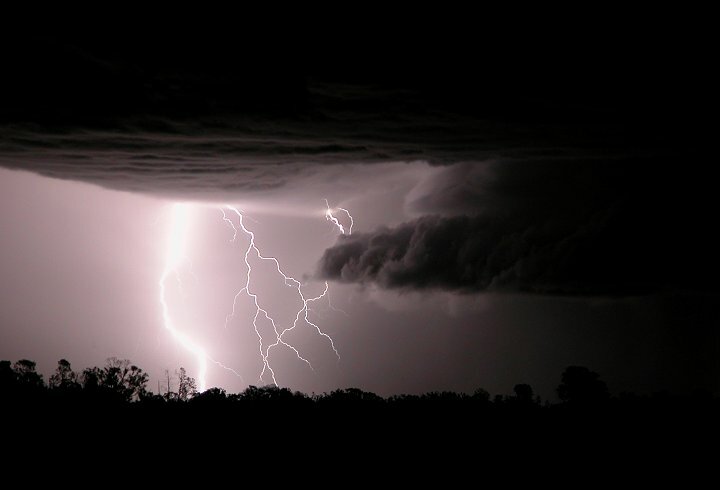 Hail was reported in the Lismore region from a storm that developed just west of the town, along with very heavy rainfall and some spectacular CG lightning. While the best storms were to be found in SE QLD, some non-severe activity developed in the Northern Rivers during this Sunday afternoon. 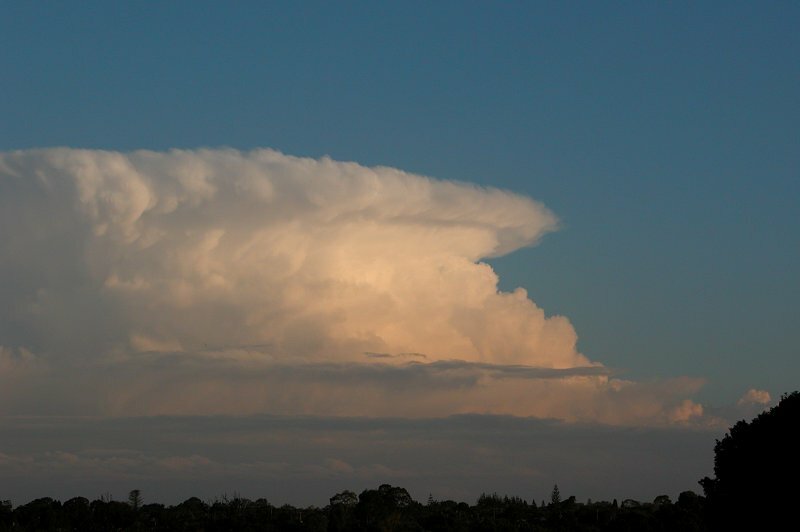 The official start to the NSW Severe Thunderstorm season saw quite a nice supercell develop just north of the border in SE QLD. 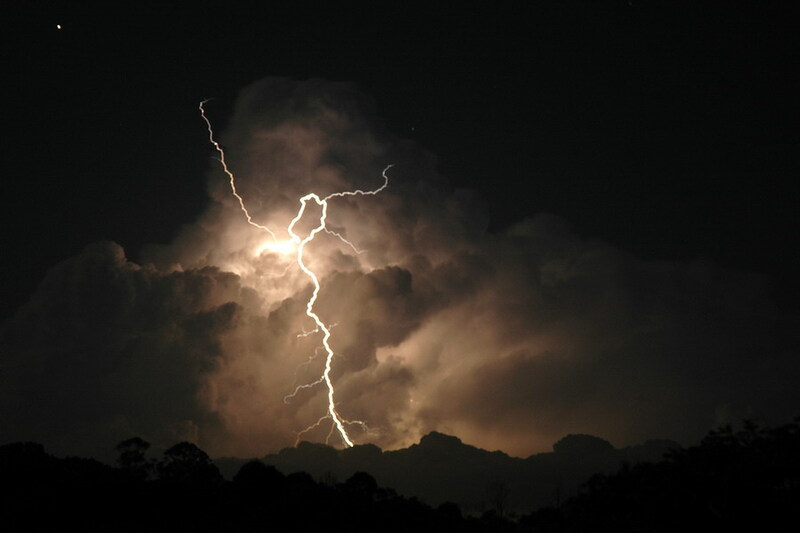 A chase was initiated in an attempt to catch the cell as it moved rapidly towards the SE into NE NSW, however the storm weakened as it reached the coast near Tweed Heads were storm chasers were waiting. 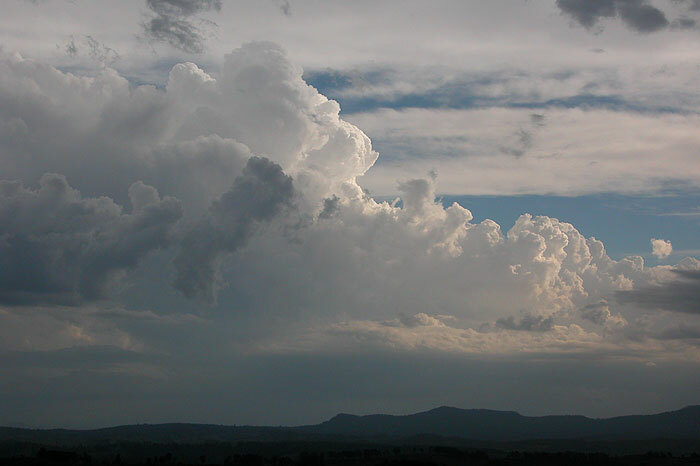 An upper level low was moving through S QLD into NE NSW, cooling the upper levels sufficiently for severe thunderstorms to develop in the Northern Rivers despite the cooler SE surface winds. Storm chasers were caught a little off guard by a severe hailstorm which dumped masses of hail in areas east of Casino through to Evans Head during the late morning. 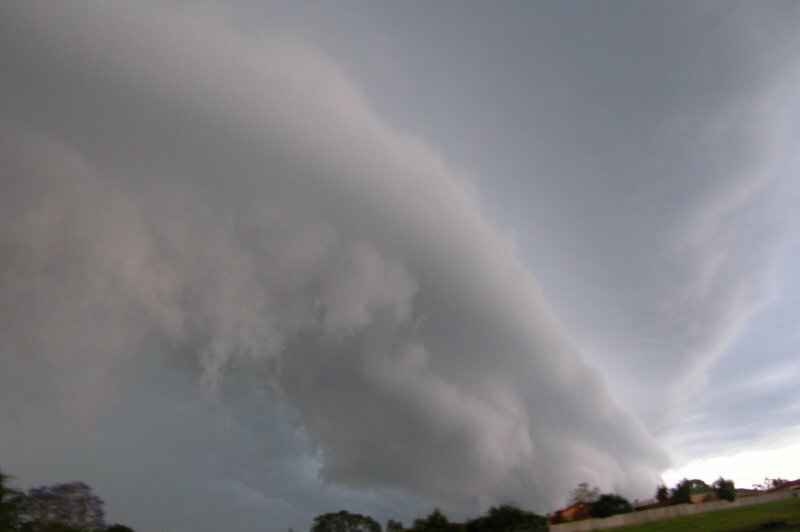 Storms that developed throughout the afternoon were more closely documented, with a spectacular shelf cloud moving over the Lismore to Ballina area later in the day. 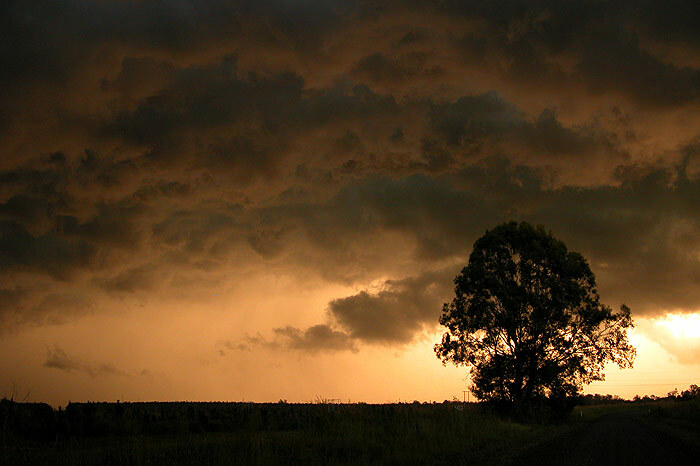 It was the first real chase of the storm season, and about time too! Perhaps the cruelest day of the storm season for the Northern Rivers chasers! The east coast north of Sydney looked destined to receive violent supercells thanks to very high instability levels and great wind shear. One problem though - the cap was too strong in the Northern Rivers! Had the cap which suppressed storm activity broken, it probably would have been a memorable afternoon. Instead, it would be remembered as a day that instead delivered weak, high based storms to the Northern Rivers. 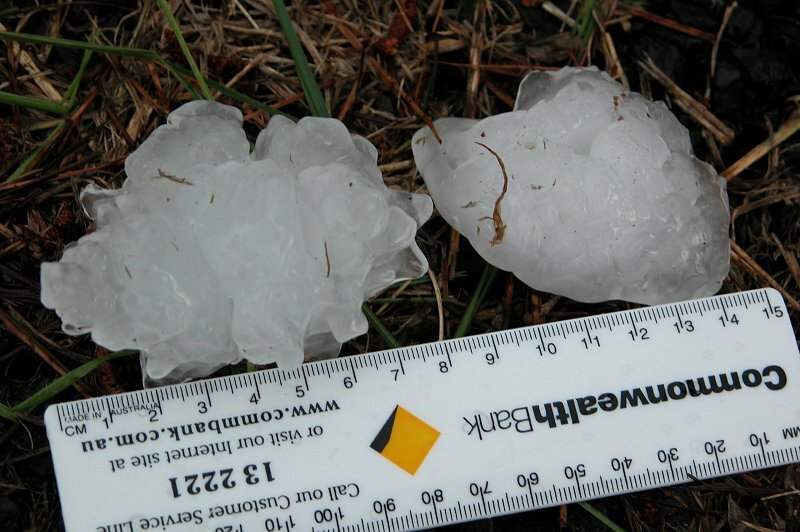 The cap did break in the Hunter Valley and violent supercells developed and produced gorilla sized hail that devastated the town of Muswellbrook. 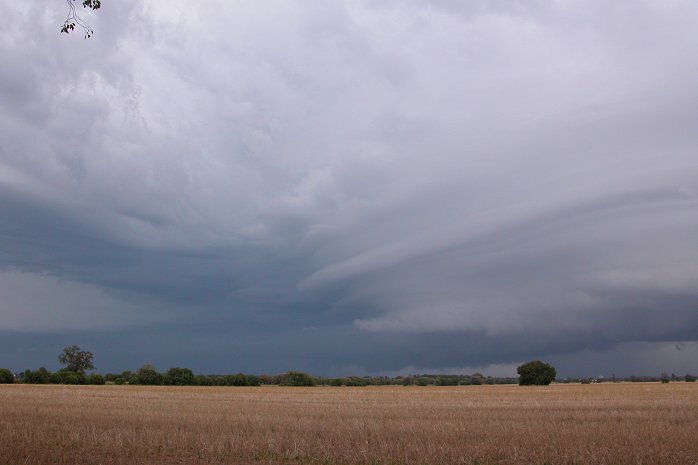 After the devastation of missing out on receiving supercells on the previous Sunday, the models had lined up a consolation prize for the Northern Rivers. With huge instability levels, good low level moisture, a dry upper atmosphere, and a wind shear profile perfect for supercells, possibly even tornadoes, the setup even enticed chasers from SE QLD into NE NSW for the anticipated onslaught of supercells! However we were once again slapped in the face by the cruel side of the weather! As was the case the last Sunday, the cap failed to break, and left us with weak storm activity during the late afternoon and evening. 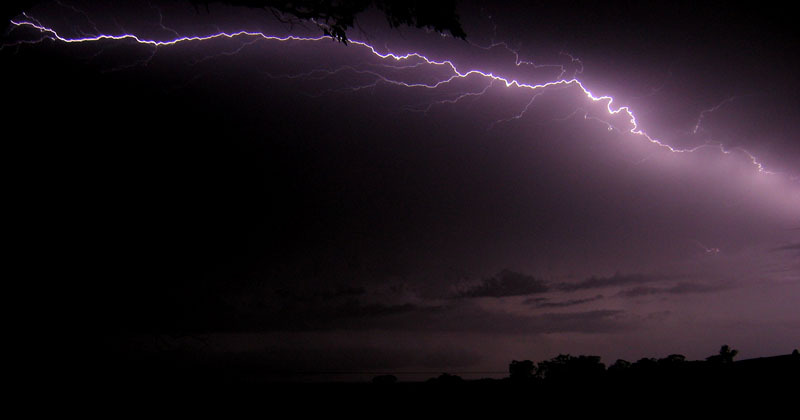 There was at least a bit of a light show to ease the pain as the weak storms moved out to sea. 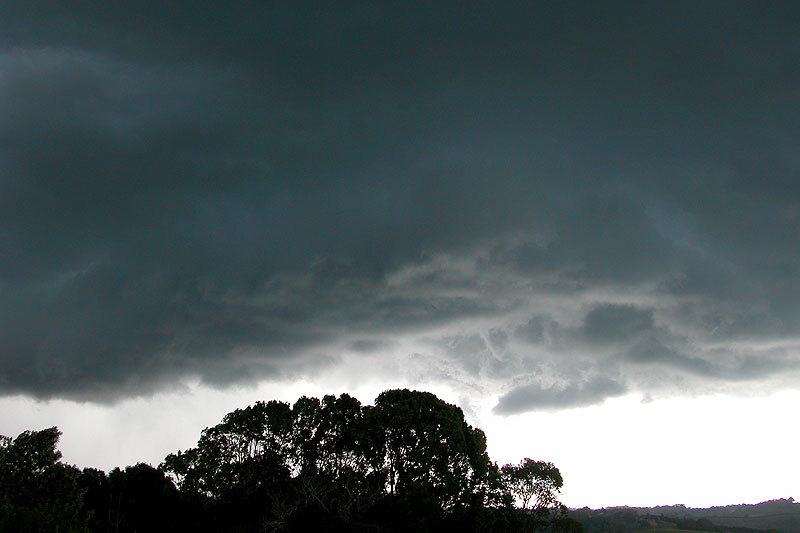 Was it really the severe storm season in the Northern Rivers? It had been a disappointing season so far, but a check of the weather forecast this spring Tuesday morning provided some hope. 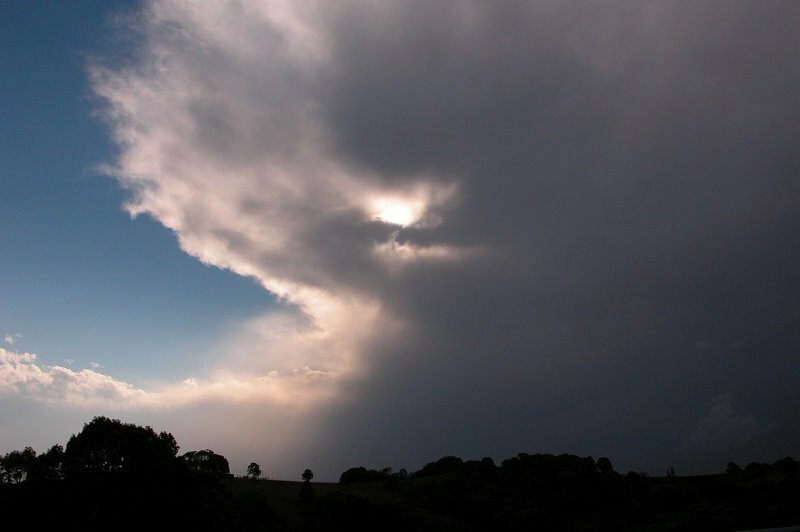 It mentioned the chance of storms with hail - a sign the weather bureau expected severe storms. The stratocu filled skies and SE winds didn't seem to back up the forecast all that well, and storm chasers were caught a little off guard by the setup. Ironically, this less then perfect setup was to provide perhaps the most memorable, and costly chase of the season! 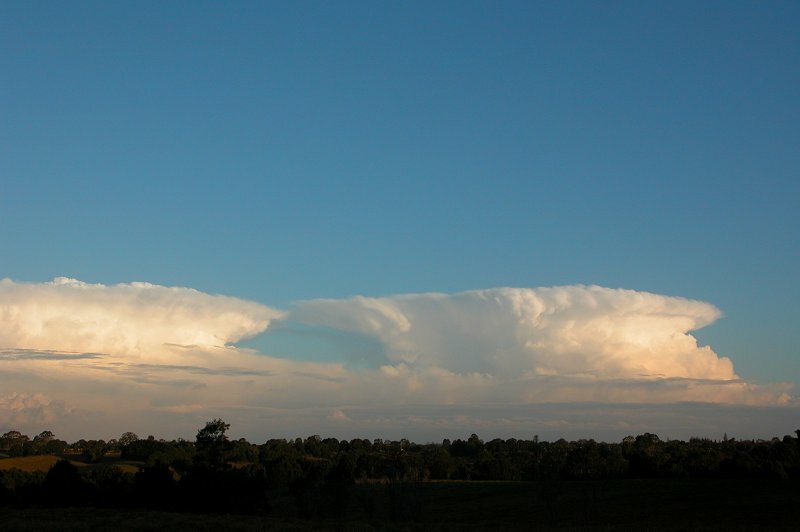 Rising from the stratocumulus deck in the Northern Rivers that afternoon were two explosive supercells, a left mover and a right mover, headed on a collision course for each other at Casino - what a rarity! And we happened to get caught right in the middle of it, copping hail at least up to 8cm in diameter which was being propelled towards the car at over 90km/hr. 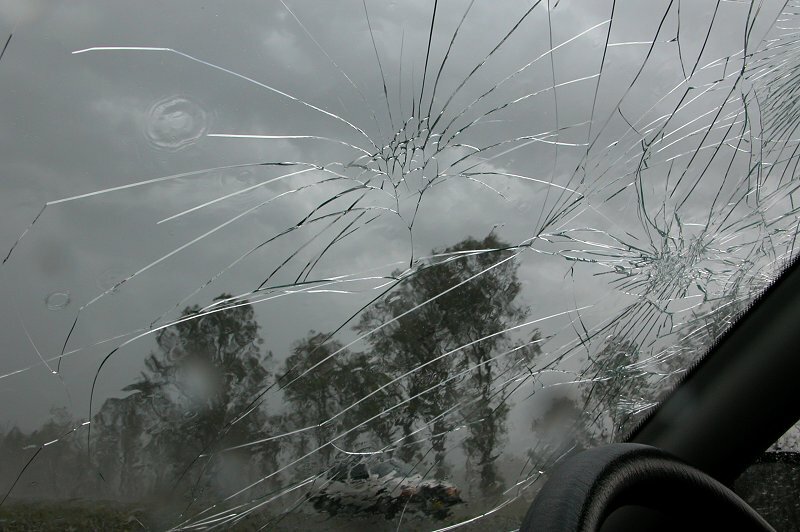 The result was a severely dented car and a windscreen on the verge of collapse. It was a lucky escape not to receive any injuries form this chase. Despite the scary encounter, we figured the memories of this chase would be worth the car repair bill! 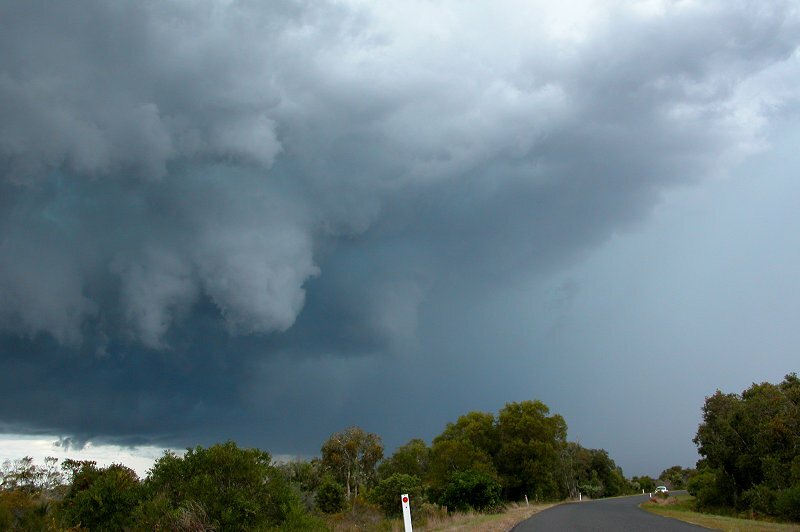 A beautiful cut-off low around the SW corner of NSW provided what appeared to be one of the best setups for explosive supercells and tornadoes in eastern Australia in about 5 years. 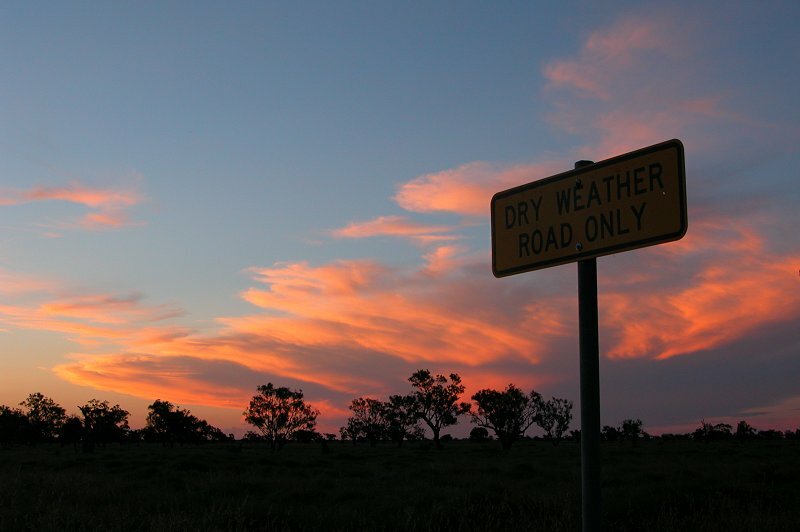 The unfortunate thing was that it was likely to remain cool and wet in the Northern Rivers, and a trip into Central and Northern NSW was required if we were to see the action. 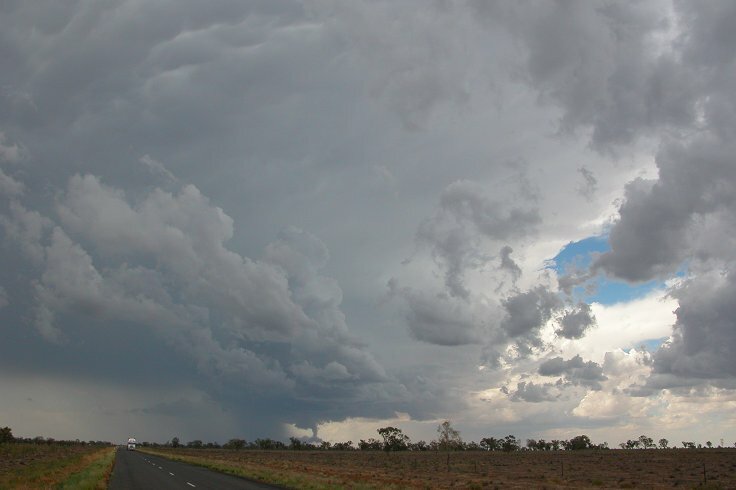 This day involved a 10 hour or so drive out to Coonamble, where a supercell was observed exhibiting strong rotation in its wall cloud region along with some suspicious lowerings. 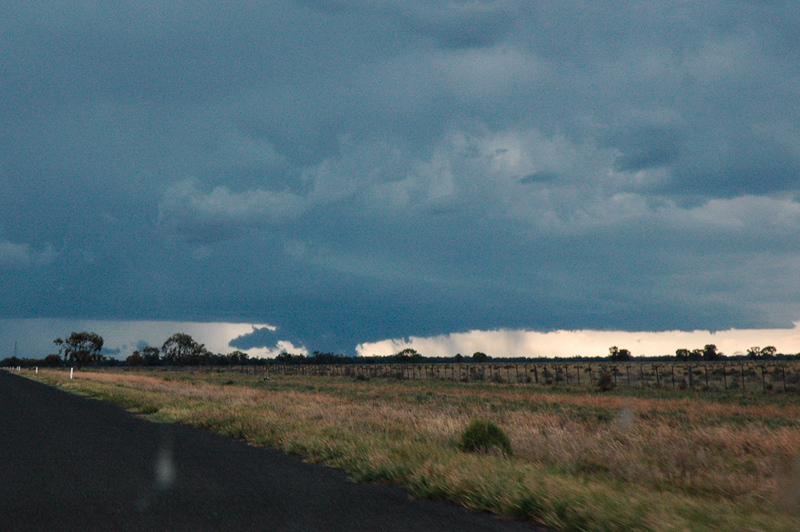 Unfortunately the poor road network meant the storm was unable to be gotten close to. 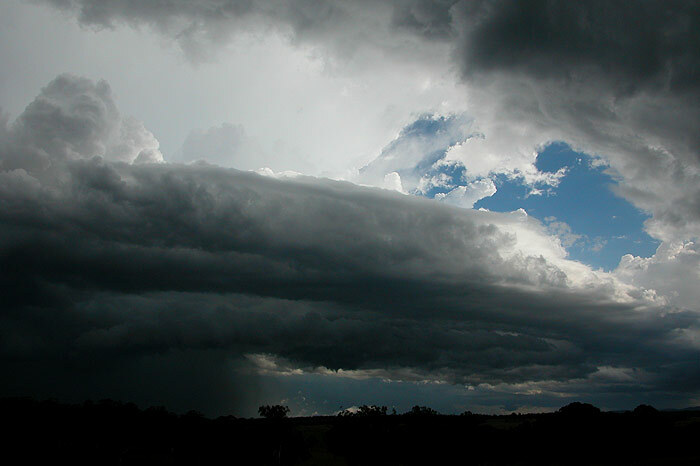 As this storm decayed, more storms developed and gave frequent close CGs and torrential rain in Coonamble. Later that evening more storms developed and gave a great display of lightning. 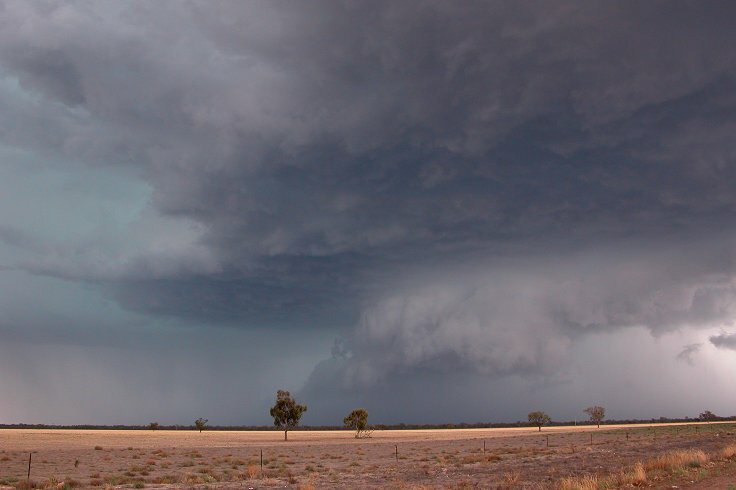 The day started out at Coonamble with high expectations of supercell development by early afternoon, and as expected, a very nice supercell developed NW of our target area, requiring not too long of a drive to get up close to it around 100km west of Walgett. The cell gave spectacular examples of supercell structure and was thoroughly enjoyed as chasers watched from a safe distance. 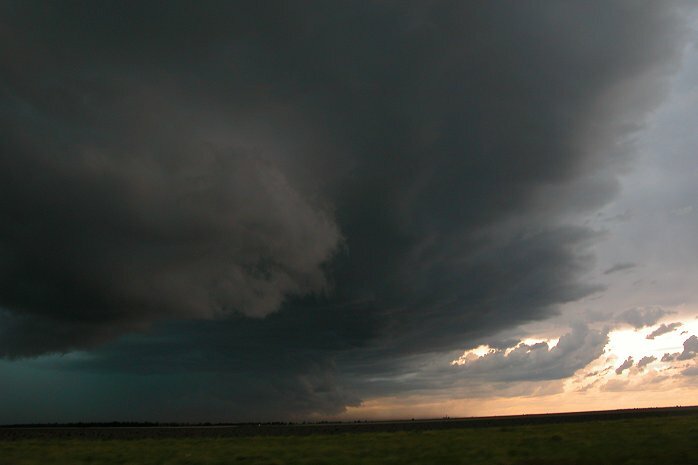 Another supercell developed and moved in from the NW, with inflow into the storm so strong that dust was being raised and sucked into the cell. Poor contrast meant this cell was less photogenic. 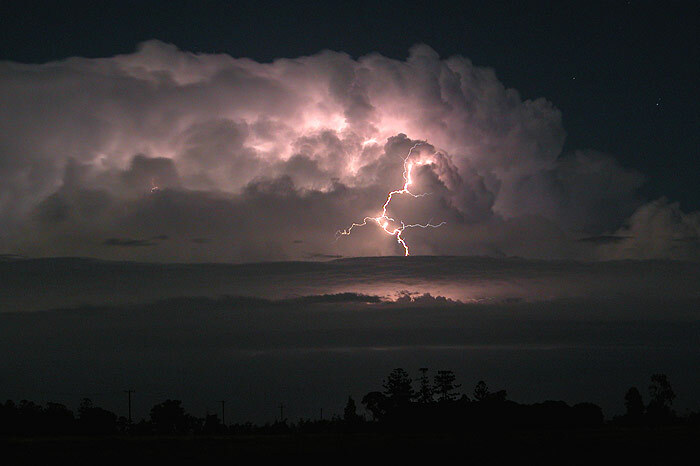 More storms developed during the afternoon and a distant light show was enjoyed in the evening. Seeing such spectacular storms made the trip very much worthwhile! 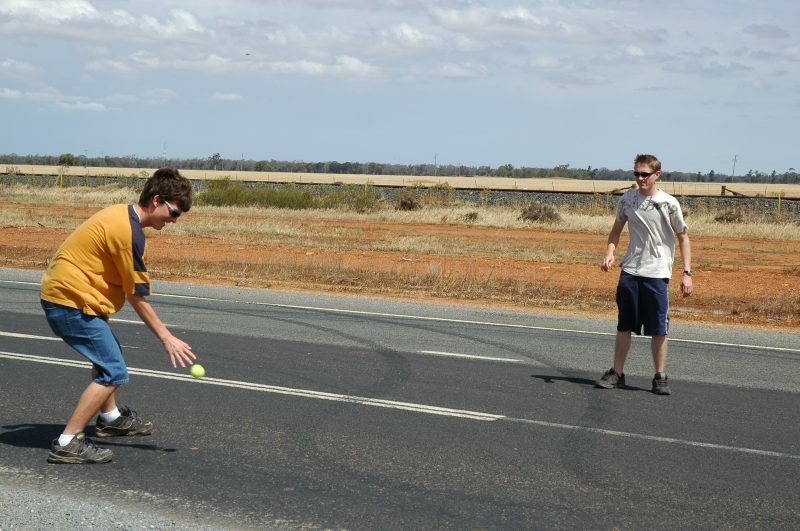 The cut-off low had pushed back further west into South Australia, and despite the models still indicating a chance of supercells in the Dubbo region, activity stayed well west of there, leaving the storm chase team to play handball in the middle of the highway between Nyngan and Cobar! 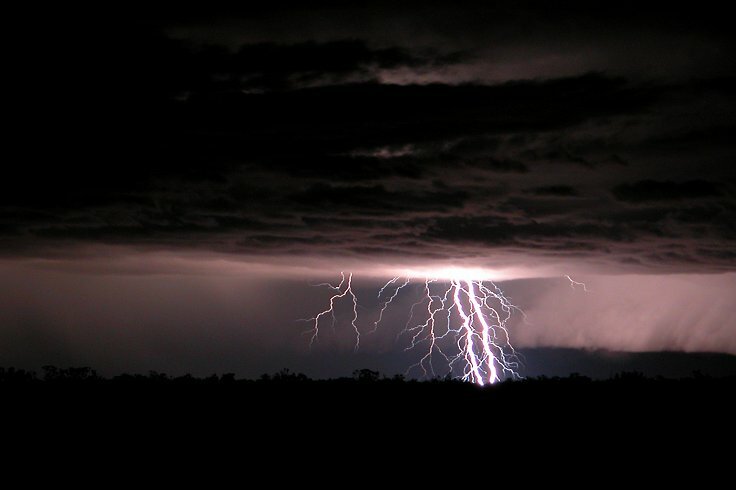 Weaker activity developed during the evening near Coonabarabran, bringing torrential rain and flash flooding that would signal the start of a flood event in inland NSW. 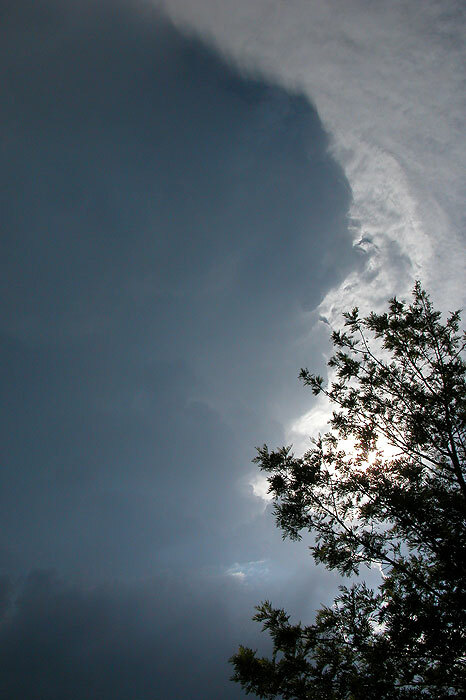 The potential for severe storms was mostly dismissed this day due to the lack of good instability, however a great wind shear profile enhanced the chances of severe storms. 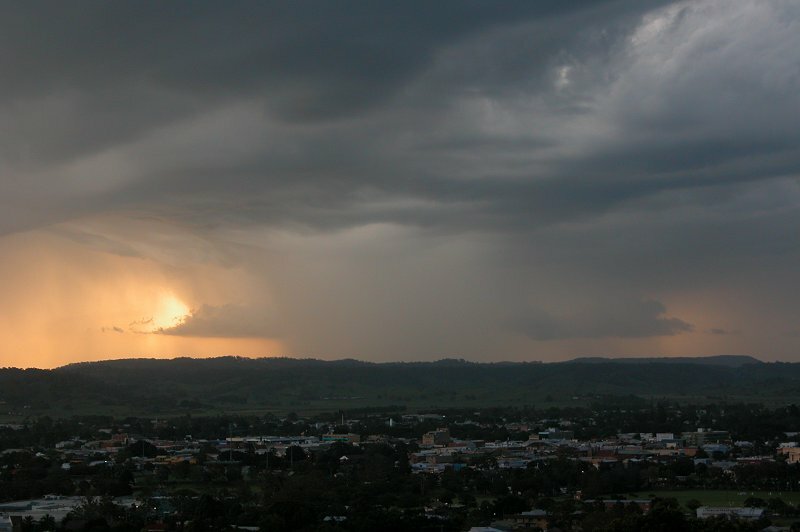 After a cluster of disorganised storms moved through the Northern Rivers region, one storm managed to get more organised, developing good inflow as it moved over the Alstonville Plateau. 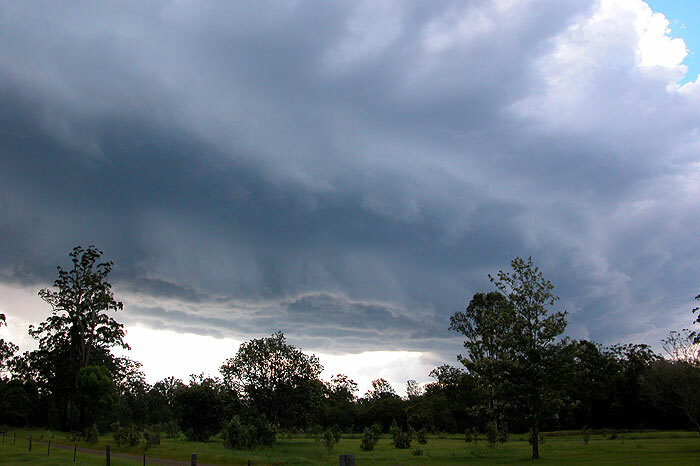 As the storm quickly became outflow dominant, it brought with it violent winds, heavy rain and small hail. Power lines were brought down in the winds, along with large trees. While damage to property was not reported, it is expected some damage was likely to have occurred given the strength of the winds in the storm. As with the previous day, wind shear was excellent for supercell development. 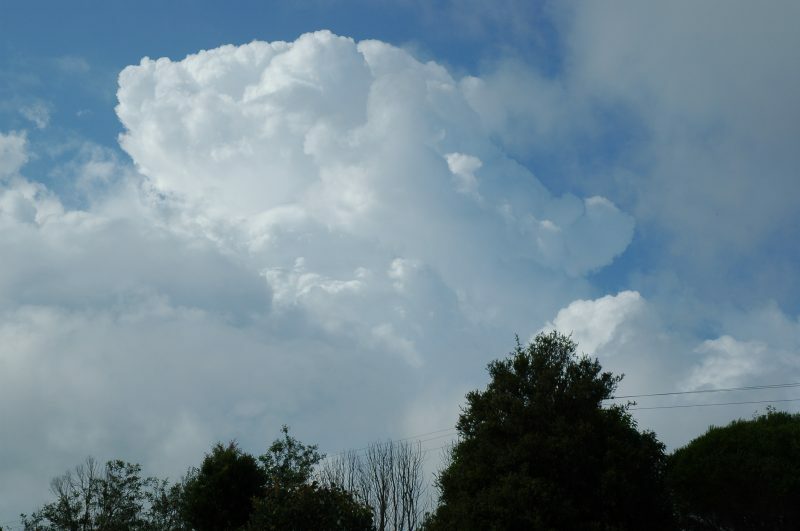 Instability figures in the Northern Rivers were moderate to high, but a strong cap over the region raised some doubt as to whether any storms would develop. 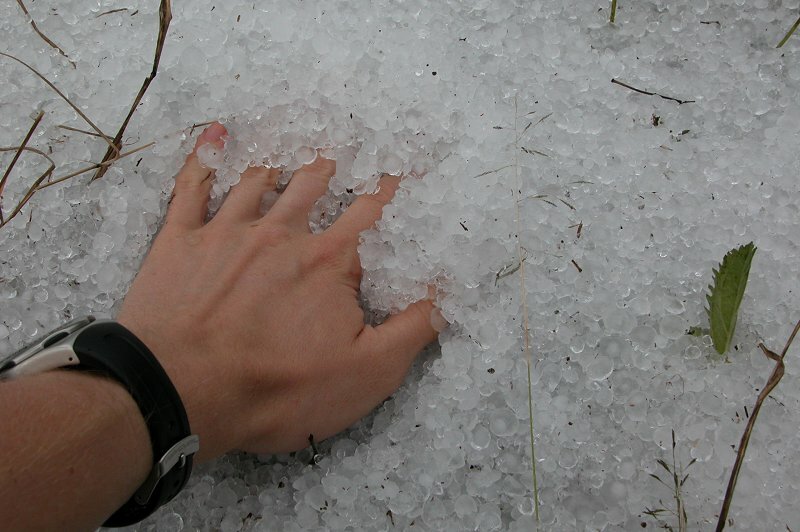 500hPa temps were also very warm, at around -7C, so giant hail seemed unlikely. Despite the concern, one isolated storm developed on the Richmond Range west of Casino, and immediately appeared to be well organised. 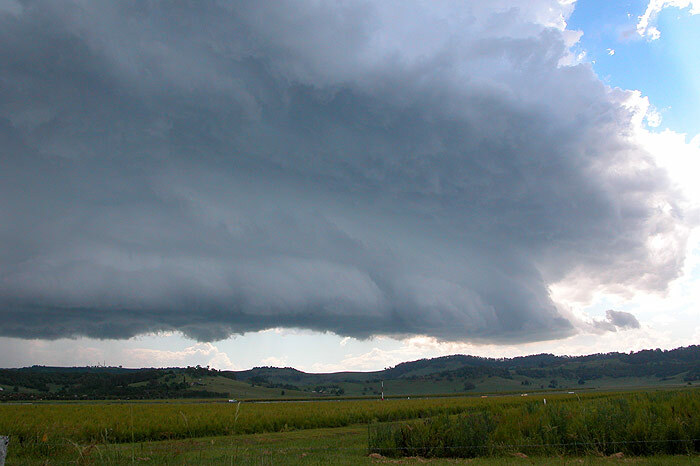 The storm, now with obvious supercell features, began to grow larger and larger as it headed straight towards Lismore. The storm brought with it violent winds which took rooves off houses in the surrounding areas along with some buildings in the Lismore CBD. Power was cut in some areas for 26 hours due to the extensive damage from the violent winds. 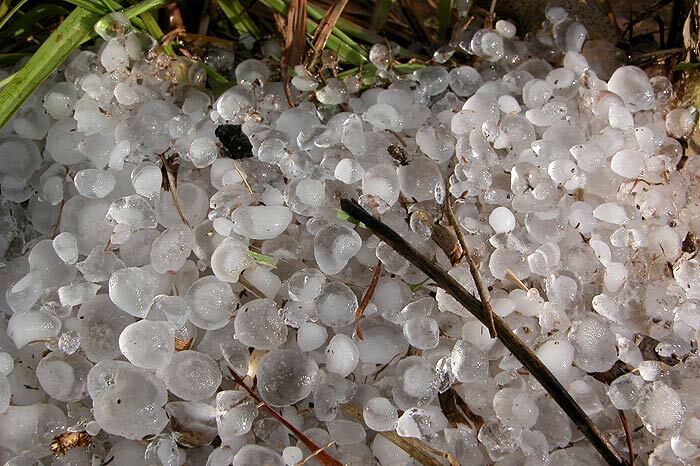 Large quantities of small hail fell, along with reports of hail up to 5cm in diameter, testament to the storms strength given the warmer upper levels. 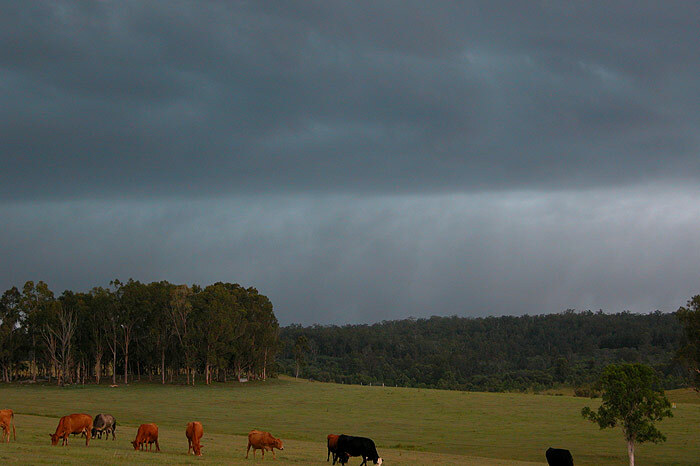 The storm rapidly decayed near Bangalow as it interacted with another weaker cell just north of it. It was one of the highlight chases for the season! Weak pulse storm development west of Casino, which appeared to be marginally severe at times based on radar analysis, prompted a chase to Lismore for observation of the cells. Unfortunately the activity was short lived and decayed after sunset. Another marginal setup, with weak instability and warm upper levels, however there was good turning in the winds with height. 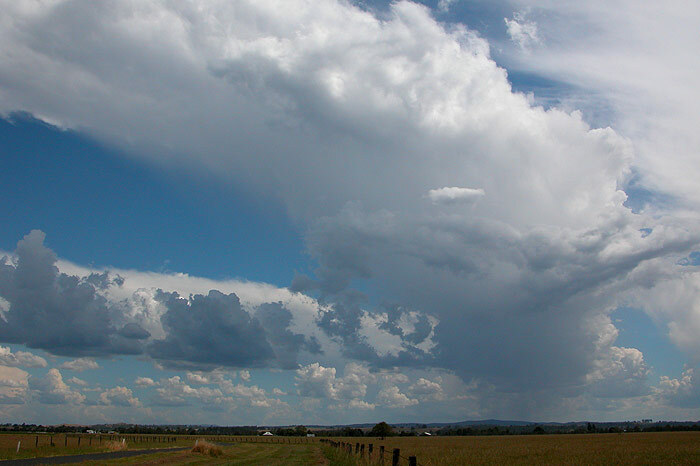 A multicell storm kicked off south of Grafton just after lunch and slowly propagated north into the Northern Rivers. 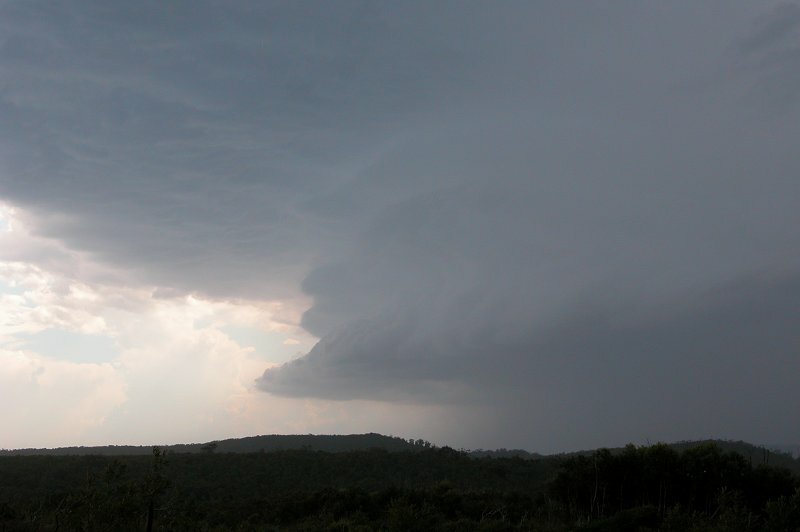 The Northern Rivers storm chasers headed down to Whiporie, an area not previously chased before, in an attempt to get up close to the cell as the weak shear made it unlikely it would survive all the way to the Casino area. 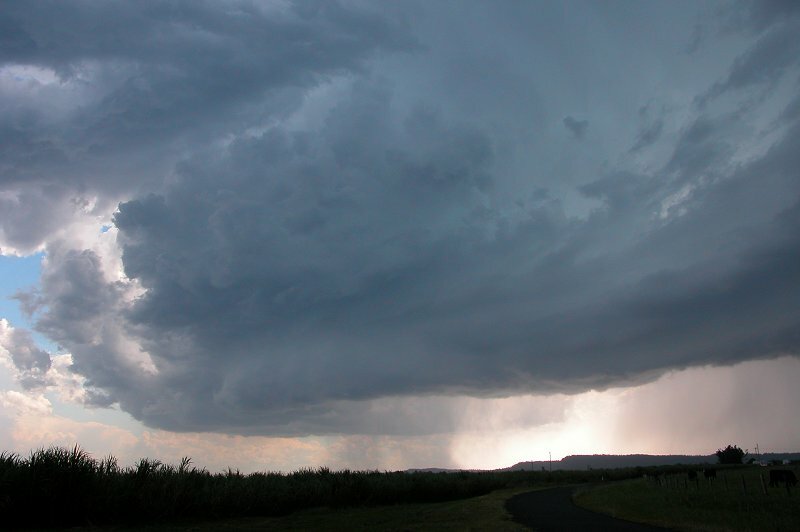 The cell gradually approached the target location, exhibiting strong updrafts, powerful CG lightning and even some base rotation as it became more organised. 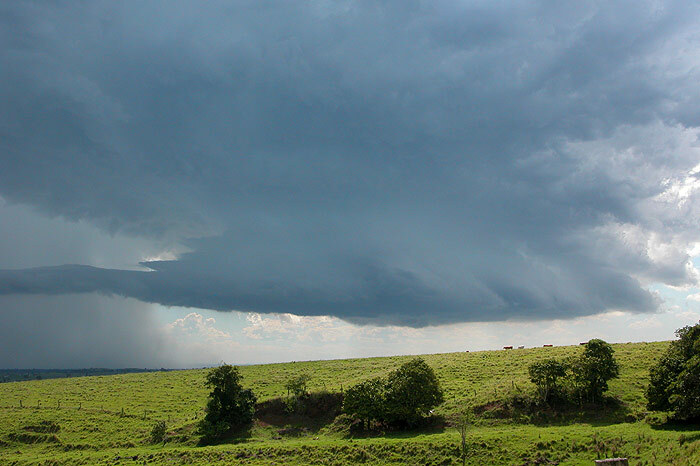 This didn't last however, and the cell appeared to weaken visually. Chasers stayed ahead of the storm most of the afternoon until it decayed south of Casino. 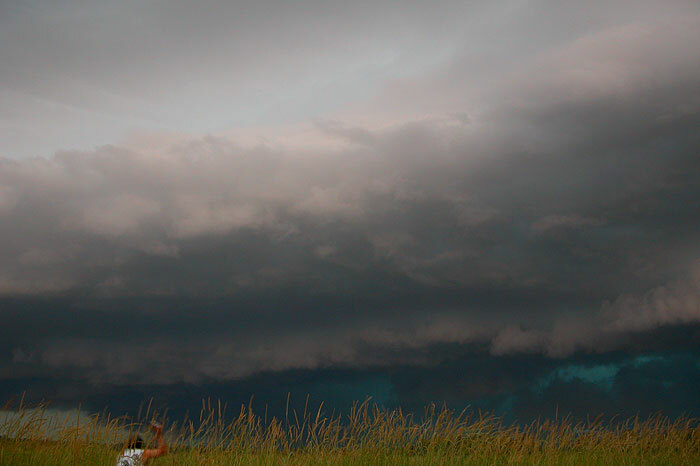 For storm chasers, you can't get a much better present than a severe storm to chase on your birthday, and this was exactly the case for Dave as he turned 21 on this day. With a good moisture profile, a moderate wind shear profile and good instability, it seemed likely that severe storms would develop this day. 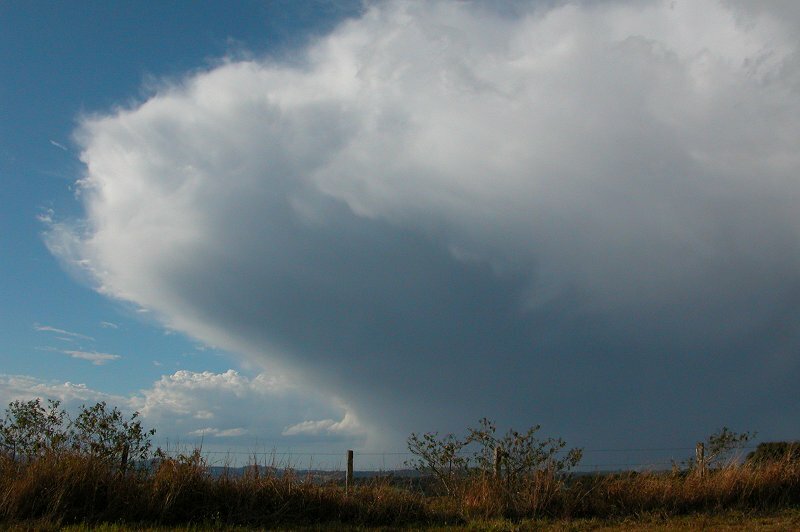 However it took some waiting for a severe storm to develop near Casino, which rapidly intensified into quite a nice storm which dumped golf ball hail on the Pacific Highway south of Woodburn, and produced a mean looking gustfront as it moved out to sea. A great birthday chase to remember! Good instability levels and an excellent setup for supercells on the following day tempted Michael and Dave to head out to the NSW North West Slopes and Plains in the hope of seeing some great storm activity. Arriving at Moree during the afternoon, not much activity was occurring nearby, and storms mostly stayed away from the area much to our disappointment, but some lightning was observed during the evening. 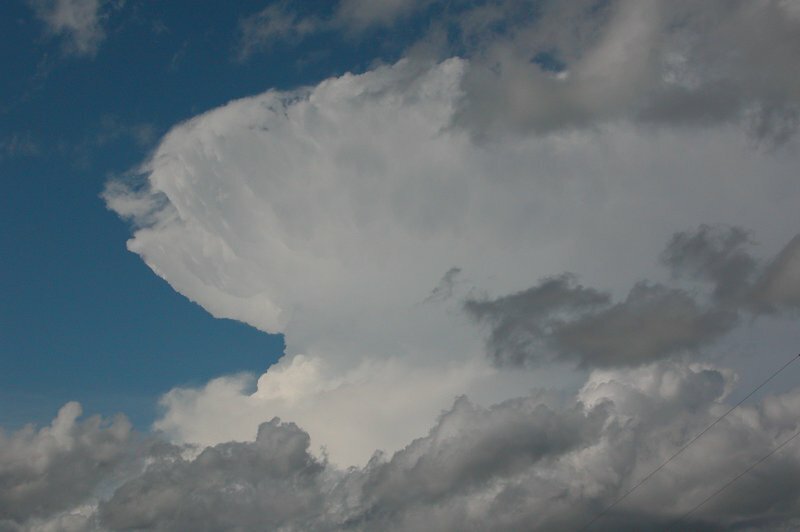 Ever wanted a supercell for breakfast? Supercells seem to be mostly confined to the afternoon and evening here in Australia, when instability figures are usually at a maximum, however strong instability and excellent shear saw storm chasers pursuing a supercell south of Moree at 8.30am in the morning! It was a strange experience, but it was nice to not have to wait for the cap to break. We simply got out of bed and started the chase! 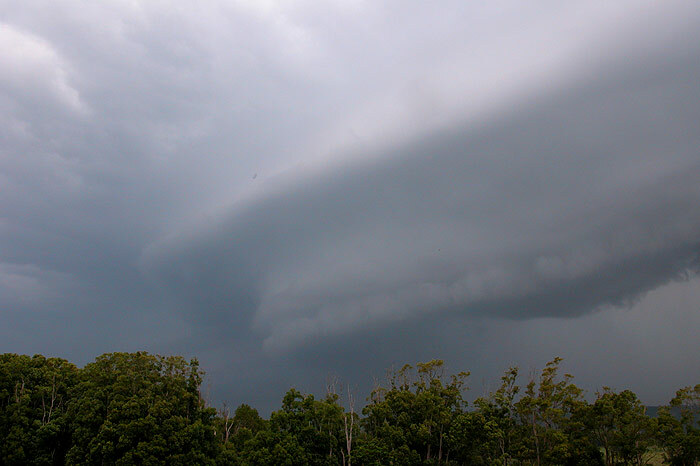 The storm exhibited great rotation, with inflow bands and striations also a feature of the storm. It soon moved off into unchaseable territory, and the rest of the day was spent watching other cells that developed in the area. 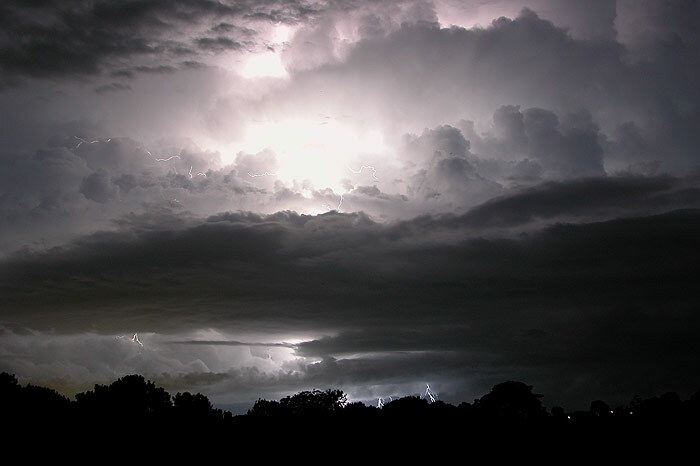 By mid afternoon, a large squall line had formed, with powerful lightning observed ahead of it. As the storm moved over us north of Moree, violent outflow winds were experienced, rocking the cars and filling the air with dust. 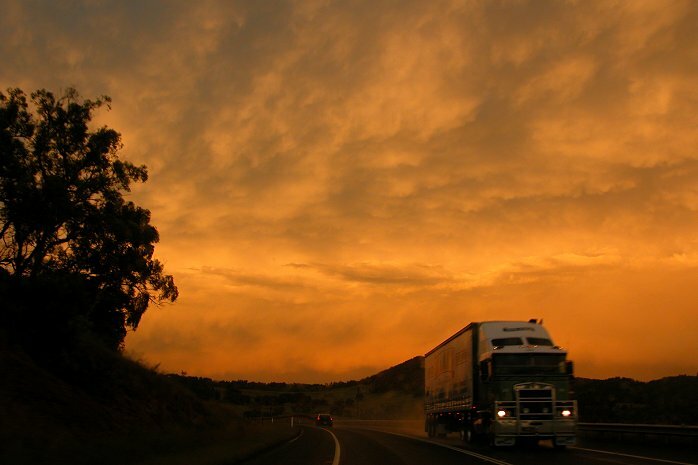 As the squall line headed east, we decided to head back towards home, observing the damage from a severe hailstorm near Inverell on the way back, as well as watching a spectacular sunset near Tenterfield. Another setup with excellent wind shear but poor instability levels. 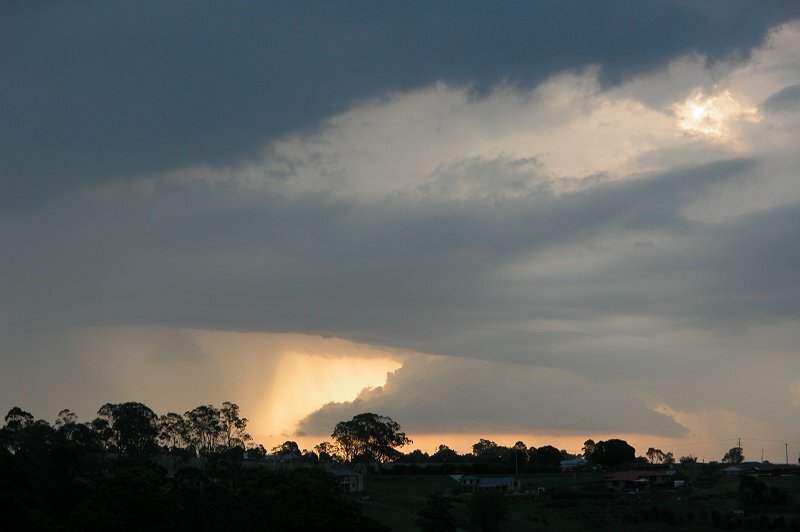 After watching weak convection all afternoon, one cell organised into a severe storm that exhibited strong rotation as it moved towards Byron Bay. 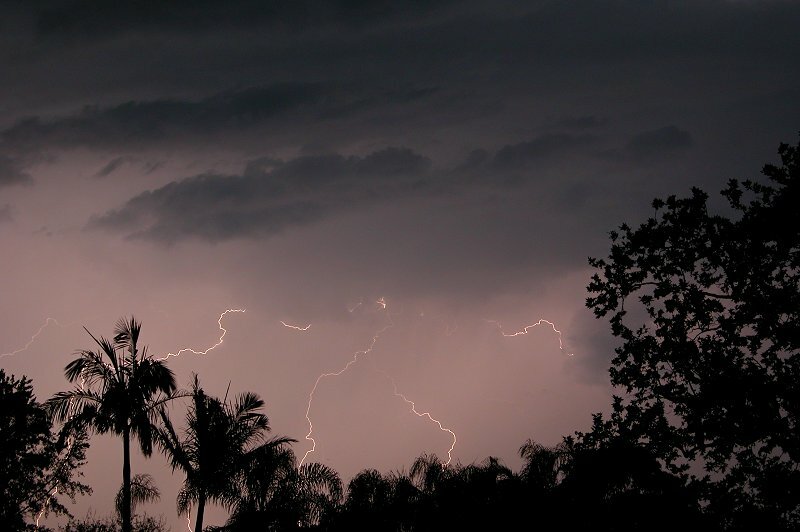 It did however weaken out into a gustfront as it passed over Byron and out to sea, but produced some great lightning bolts and severe winds in a localised area where the possible mesocyclone passed over. There was no shortage on instability this day, with GFS forecasting CAPE around 3500! 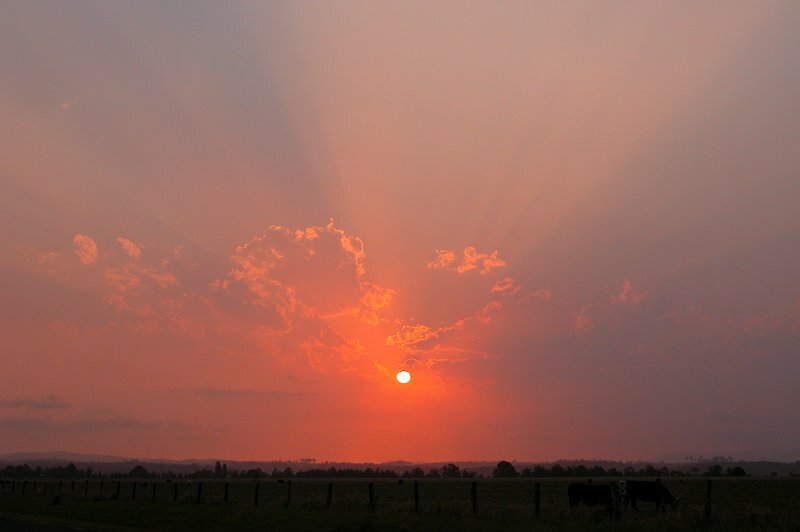 The trough responsible for the storms had produced violent tornadoes the previous day in Northwest and Central West of NSW, however shear had weakened considerably as the system reached the Northern Rivers. 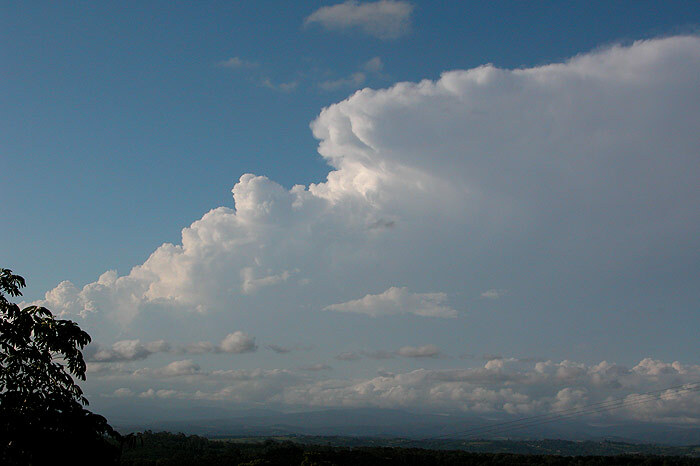 After a tense afternoon waiting in the very hot temperatures for good development, one storm finally began to develop between Casino and Lismore. The storm was very high topped and was producing frequent powerful CGs - an indication of the high cape environment. Driving through Lismore, multiple CGs were hitting around the car letting off incredible cracking noises, and small hail along with strong winds were encountered near Goonellabah. 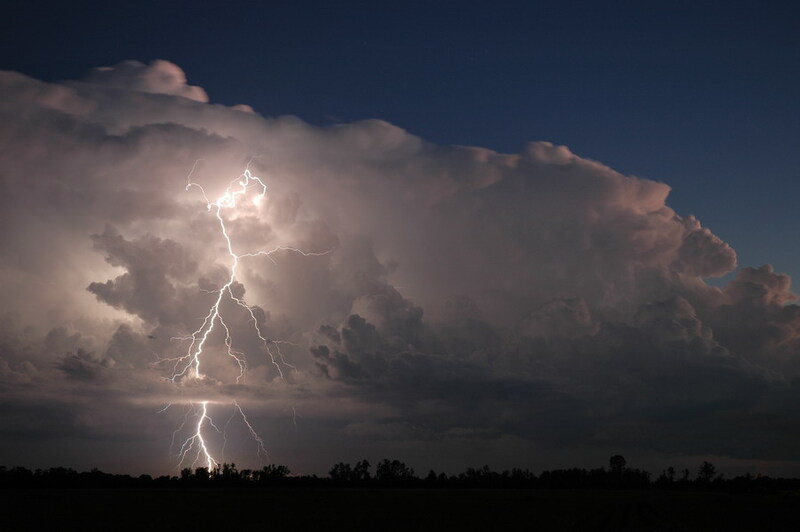 As the storm rapidly weakened near dusk, new development occurred south of Coraki, remaining almost stationary as it produced spectacular lightning well into the night. Shear was even weaker than the previous today, but instability was huge once again. Strong convection began around lunch time along the Great Dividing Range, but failed to move off the ranges into our target area. We spent the afternoon watching convection to our west until a cluster of storms began to make their way north into the Northern Rivers. 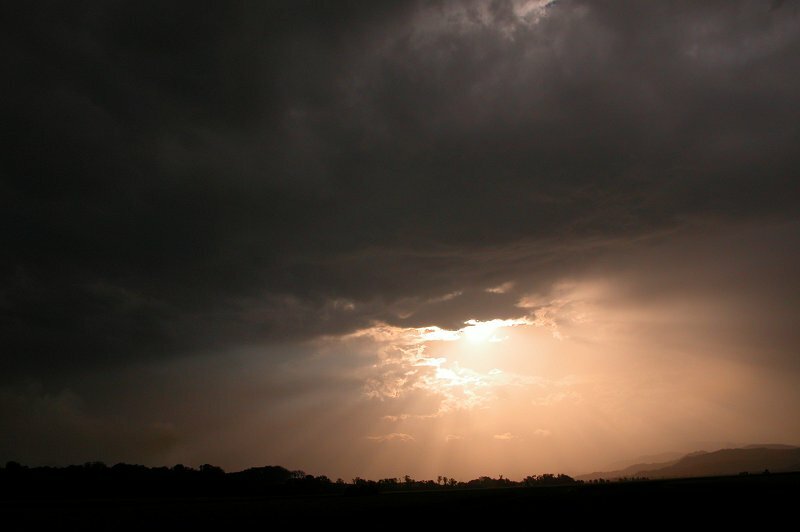 It seemed as though the storms had modified their environment and were moving quite quickly. Just after sunset we were greeted by a massive gust front on the Summerland Way, with frequent pulsating lightning occurring behind it. We stayed ahead of the line all the way back to Parrots Nest, stopping occasionally for lightning photos. 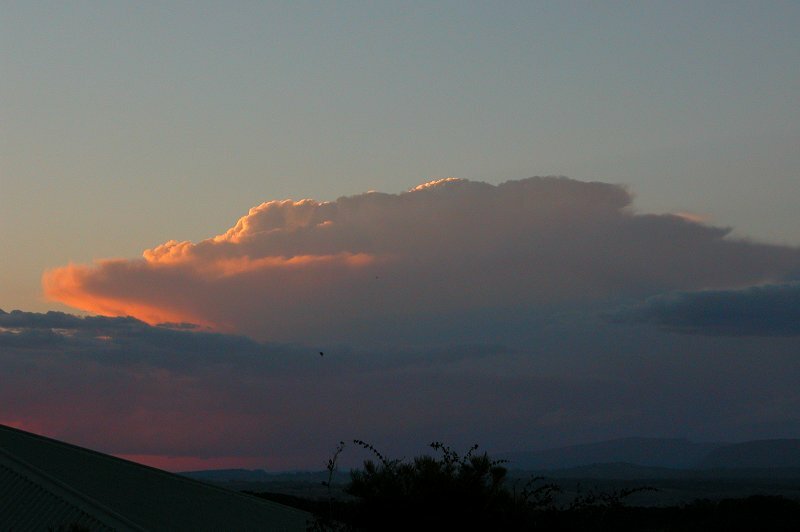 It ended up being quite a large and spectacular storm which we were lucky to get given the lack of shear. 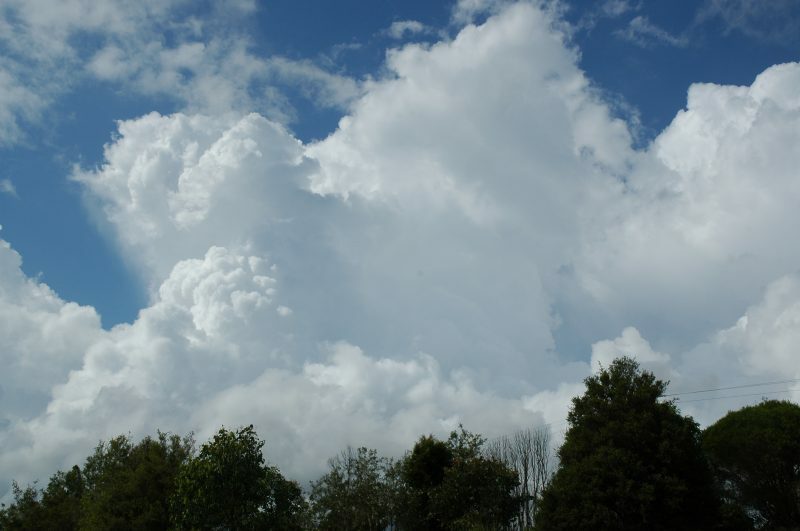 High levels on instability persisted from the following day, however shear was so weak that no convection that developed moved. There was also no cap, so the region became cluttered with cloud, and no great storm features were observed. 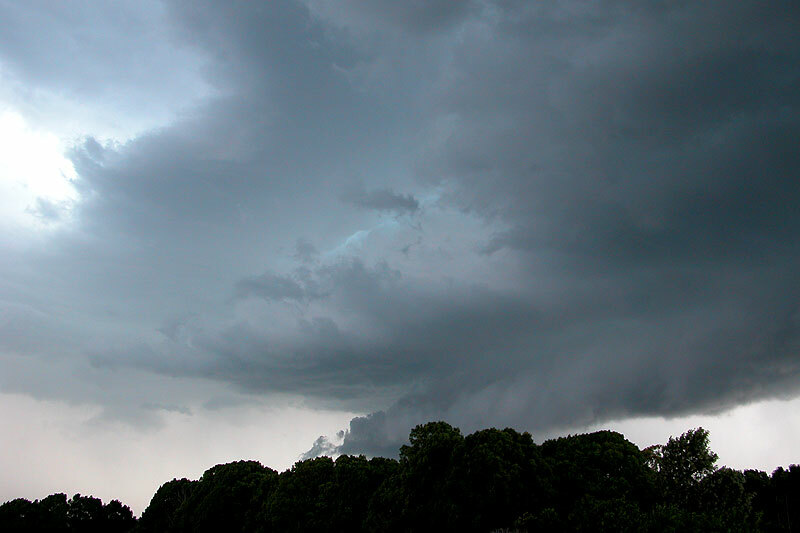 A cold front and associated trough were moving through NSW, bringing a very volatile storm setup to the Sydney region, with a huge HP Supercell and brief tornado causing extensive damage in some suburbs. 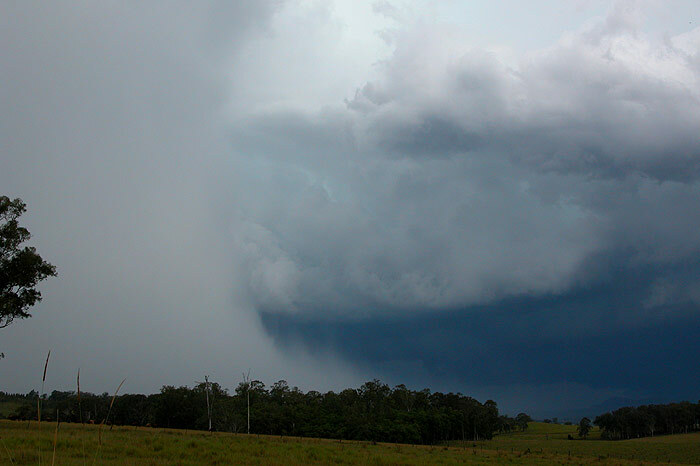 The same trough triggered storms in the Northern Rivers, with a large storm observed near Whiporie. As the large gustfront moved over the region, the cell weakened and more storms developed to the north, giving a lightshow well into the evening. 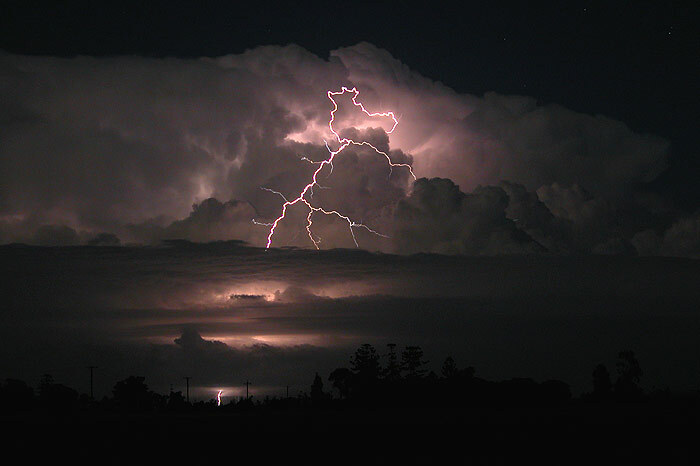 Rare ground-to-cloud lightning was captured on camera from the cell later that evening. 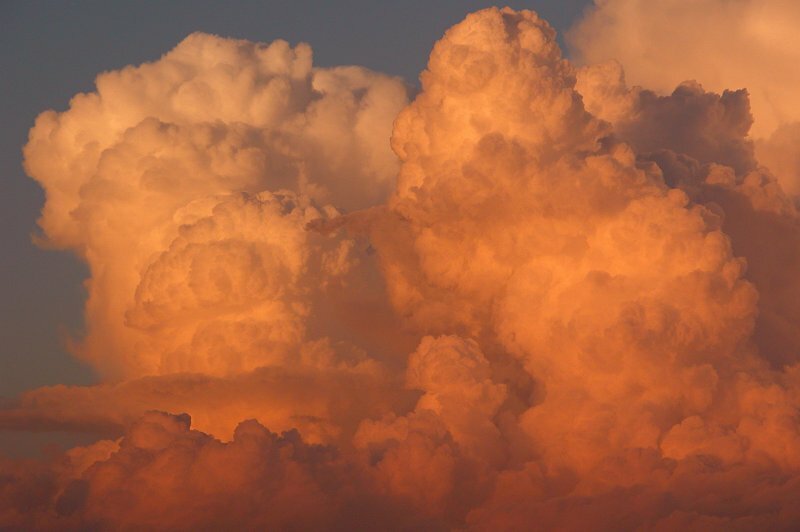 Humid onshore winds feeding into an upper trough over the Northern Rivers, along with an amplifying trough over Northern NSW, provided enough instability for weak storms in the Northern Rivers district and severe storms on the Northern Tablelands. Weak storm cells developed off the coast between Ballina and Evans Head during the evening, giving lightning, thunder and torrential rain to the coastal fringe right through the night, with Evans Head scoring an amazing 102mm in the 24hrs to 9am the next day. Despite the marginal setup, with very poor instability and wind shear, a few cells managed to get going in the Northern Rivers during the afternoon and into the evening. 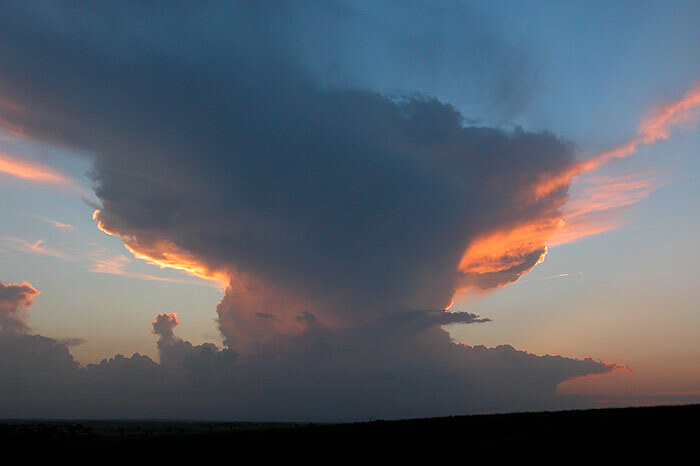 One particularly impressive looking storm developed west of Casino just after sunset, and looked like an atomic bomb had gone off and created a mushroom cloud. Despite it's impressive appearance, the cell produced very little lightning and barely moved from its original location. 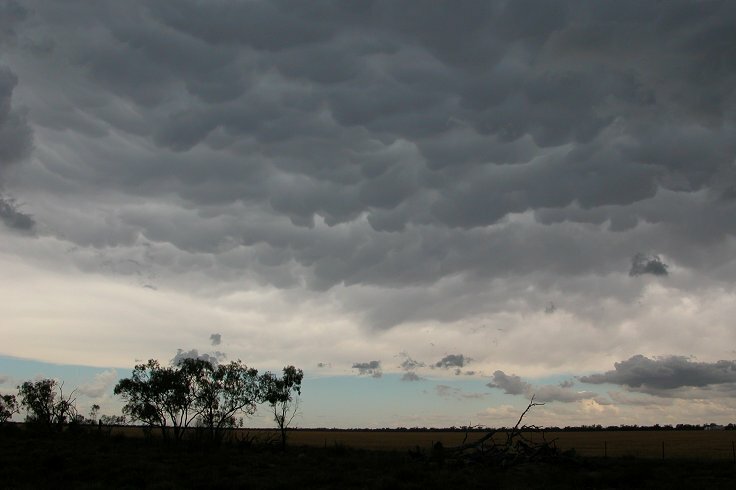 A weak surface trough in the region gained upper level support thanks to an upper trough, increasing instability and wind shear across NE NSW and leading to severe storm development in the inland parts of the Northern Rivers. A number of storms developed locally, but the highlight of the day was a cell which tracked N from SW of Grafton for several hours, eventually reaching our target area near Mallanganee before rapidly dying after interacting with other local development. 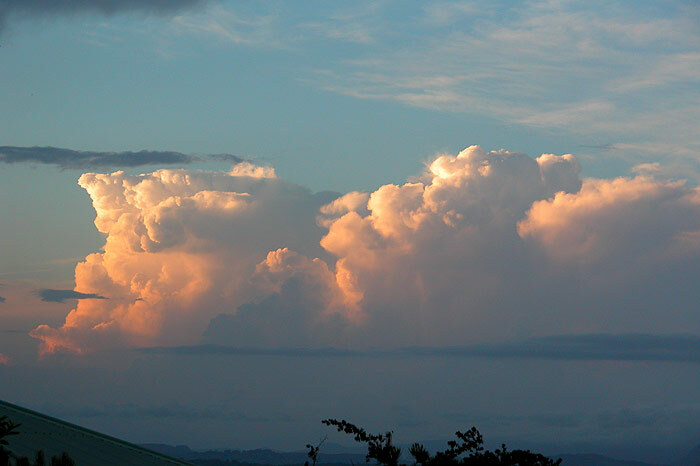 Weak storm cells developed during the afternoon in the Northern Rivers, with some slightly stronger cells forming off the North Coast during the evening. 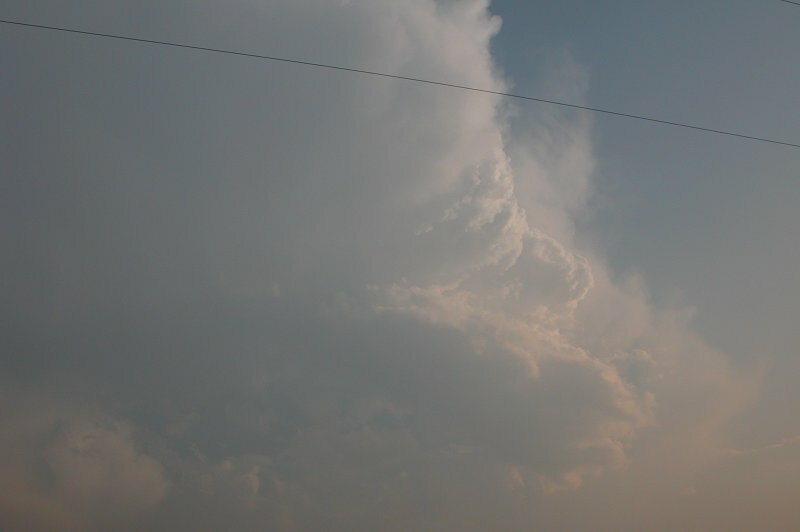 One cell in particular managed to push a bit higher into the atmosphere and unleashed a barrage of CGs, before weakening about 5 minutes later. Another storm began to develop west of Casino at around 11pm, and dumped hail up to 4cm in diameter as it moved over Casino at around midnight, continuing on till it passed out to sea some time later. Third photo taken by Maraie Halstead. 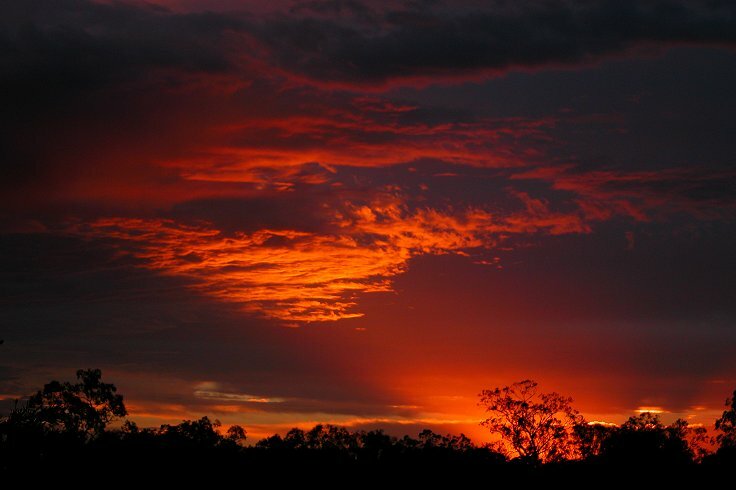 High levels of instability which developed well after sunset in the Northern Rivers caught chasers off guard. 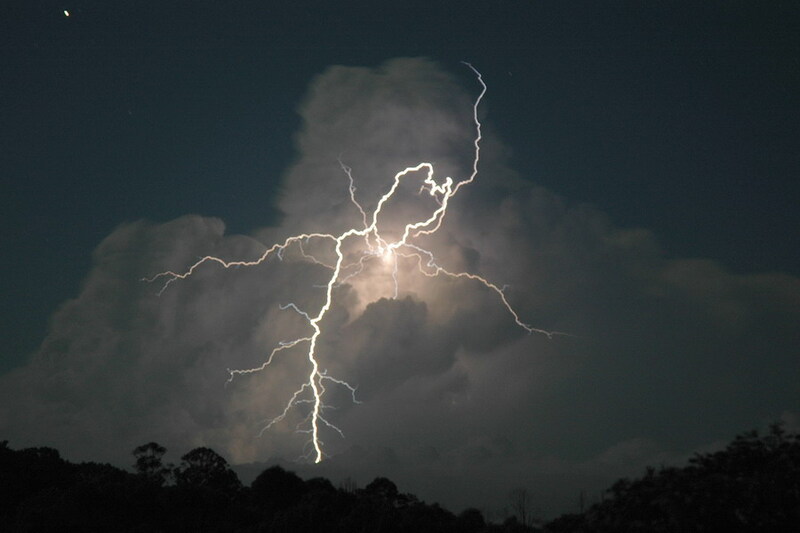 A southerly change that was moving up the coast triggered some storms along the coastal areas south of Grafton which tapped into the high cape levels to produce a spectacular lightning display as activity moved closer to Ballina. 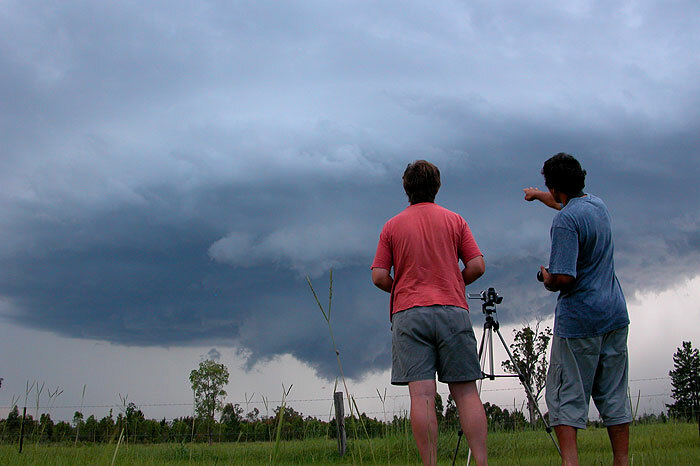 Once aware of the storms, chasers headed out to set up the cameras near Tucki, before moving down to Woodburn and then Ballina in an attempt to photograph the activity. With an impressive cold pool dropping 500hPa temps over the Northern Rivers down to around -19C, it was not surprising that despite the cooler SE winds and low surface temperatures, severe storms still managed to develop. There were two main cells to target in the area - one heading for Evans Head and another heading for Tabulum. 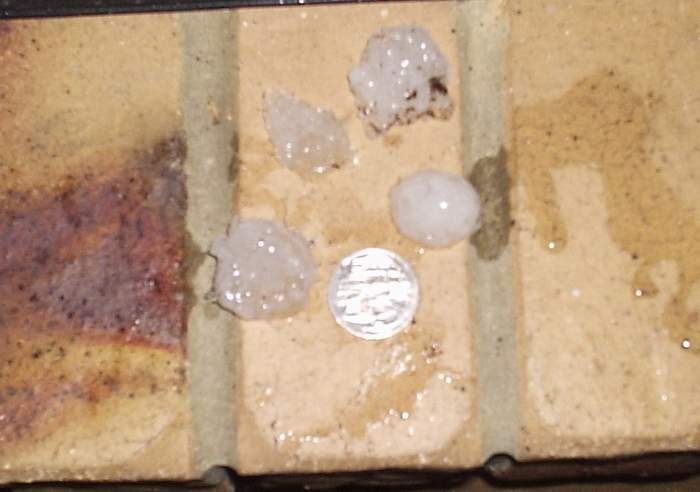 Both storms were intercepted by two separate chase teams, and large quantities of small hail were recorded in both storms. Another cell that developed near Old Bonalbo reportedly produced giant hail large enough to dent cars, but this cell was not documented by chasers in the area. Some NNW moving storm cells developed between Ballina and Evans Head from about 8am. 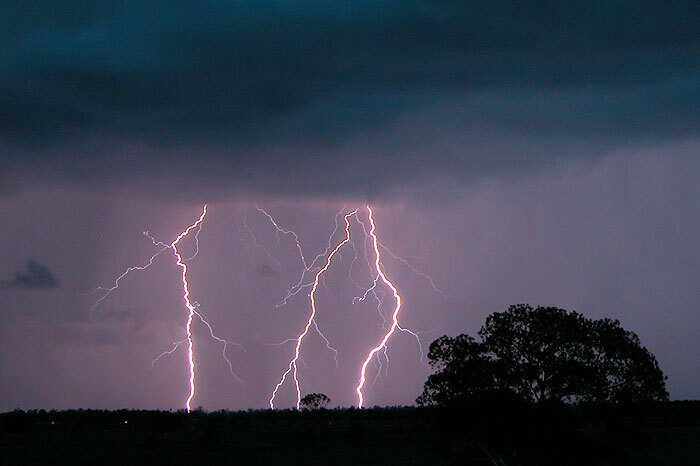 The first thunderstorms were smaller and tracked mainly between Ballina and Alstonville. 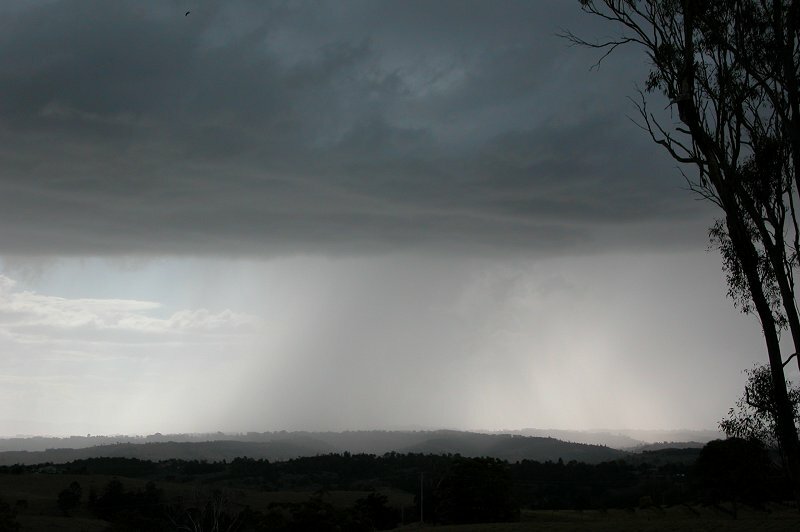 However a larger slow moving system consisting of multiple cells formed near Ballina and tracked over and mainly west of Byron Bay during the early afternoon. The storms were not lightning active but produced some flash flooding and strong wind gusts. 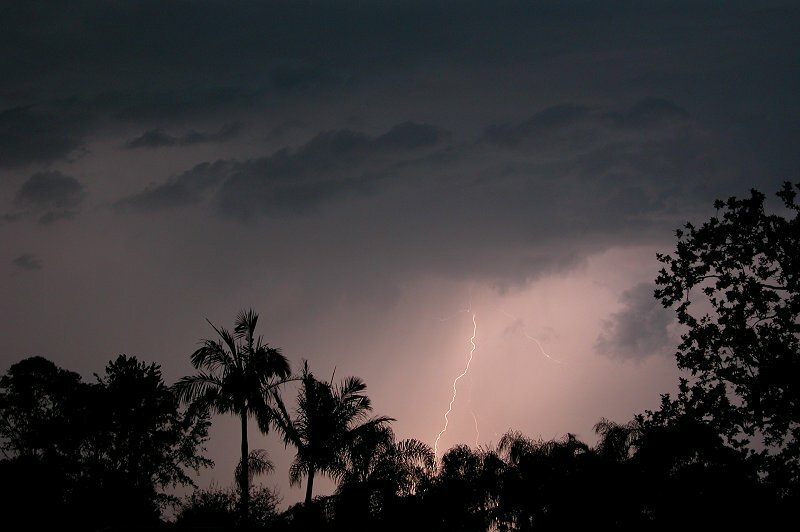 The Bureau of Meteorology issued a severe thunderstorm advice for the storm. 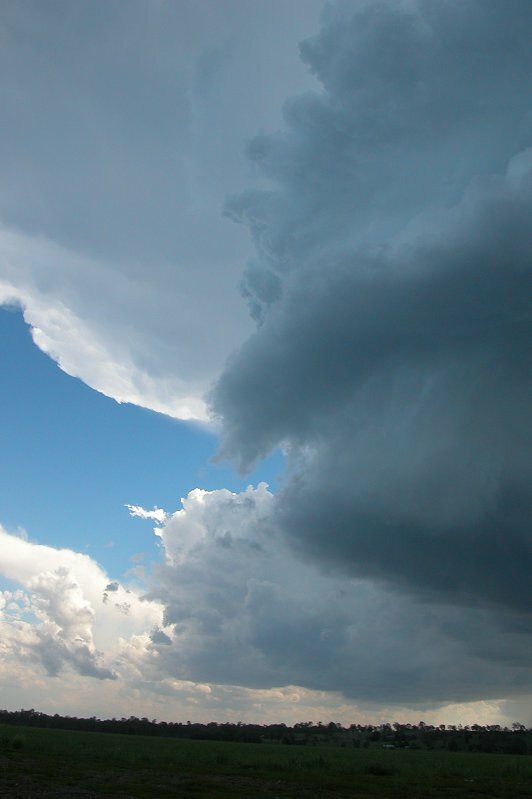 A wind gust of 102km/h was recorded at Cape Byron shortly before the warning was issued. Byron Bay recorded 122mm between noon and 3pm, while the nearby Belongil AWS recorded 104mm, 76mm of which fell in the hour to 3pm. 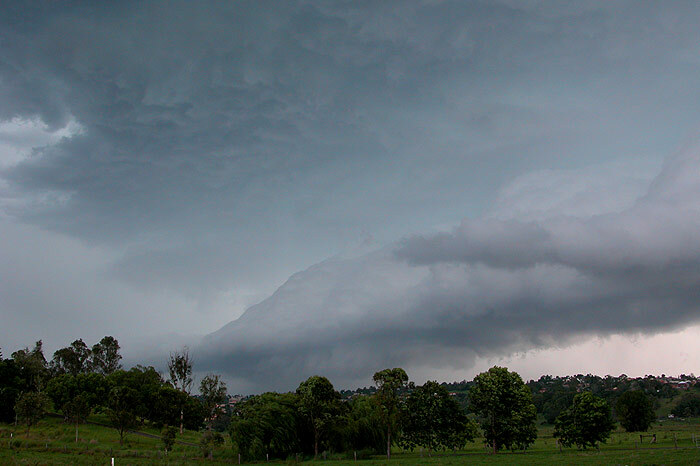 Fernleigh about 10km to the west recorded 80mm during the event.